Hastings & Bexhill Rugby Club will be determined to make the most of its last chance to record a home victory this season. H&B won all of their Kent One matches at William Parker last term, but are yet to triumph on home soil in 2014/15 going into the visit from Park House today (Saturday). Kick-off is 3pm. 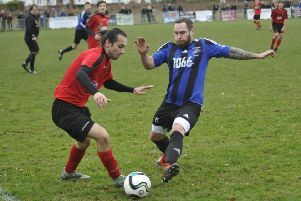 Bottom-of-the-table H&B are two places and 14 points adrift of their opponents, who were promoted with them last year. “It’s about belief,” continued Smith. “We’re playing some good rugby, but we’re not playing it for long spells and we’re not making the right decisions at times. H&B captain Jimmy Adams will return after missing last weekend’s 27-11 defeat away to Pulborough. “We’re going to go down, but we’re playing for pride now,” said Smith. Rye RFC, meanwhile, will conclude its home programme in Sussex One against Hove II this afternoon. Second-bottom were victorious in their last outing at New Road against Holbrook, but were unable to raise a side for last weekend’s trip to Hellingly.